Thanksgiving 2018: Does Turkey Make You Sleepy? Thanksgiving is a great time to spend a day or a weekend with family and friends, reconnect with your extended family, and be thankful for the loved ones in your life. It’s also a time to enjoy great food, and no thanksgiving dinner would be complete without a turkey, stuffing and all. After you’ve stuffed yourself with Thanksgiving dinner, you’ve probably experienced extreme drowsiness, or the ‘food coma’ that’s generally associated with holiday dinners. Everyone needs an afternoon nap before the festivities can continue, and it feels like every room in your house has someone who’s succumbed to sleep. While we often blame the turkey for our drowsiness, it might not actually be the real culprit. Why do we blame the turkey for our drowsiness after dinner? There’s some amount of truth in it because eating turkey can make you sleepy. Turkey contains L-tryptophan, an amino acid that’s often linked with sleep. It encourages serotonin production in your brain, and this makes you feel relaxed and sleepy. While turkey is full of L-tryptophan, it’s not the only food that contains a lot of this amino acid. Just about every high-protein food you eat on a regular basis, like other meats, cheese, nuts, and even meat substitutes like tofurky, have equal levels of L-tryptophan, and could also make you feel tired. Not only that, but consuming L-tryptophan isn’t enough to cause serotonin production, and this amino acid by itself isn’t enough to make you sleep. 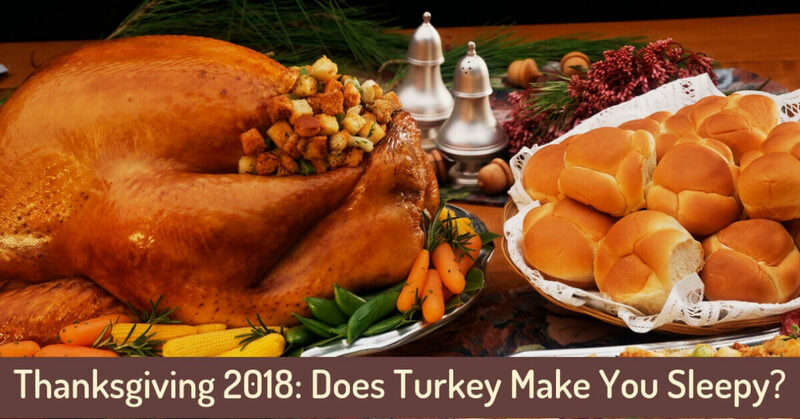 In fact, turkey contains not just L-tryptophan, but a whole lot of protein and other amino acids that block L-tryptophan from producing serotonin, and regulate insulin levels, keeping you awake instead of putting you to sleep. What Makes You Sleep After Thanksgiving dinner? If it’s not the turkey that’s making you sleep, what is it that makes you feel so drowsy? The answer seems to be carbs. When you eat foods that contain L-tryptophan, like turkey or other meats, along with a lot of carbs, you’ll often feel sleepy. The mashed potatoes, bread, and pie you ate during dinner are what’s responsible for your desire to pass out on the couch rather than chat with your cousins or do the dishes. When you’ve stuffed your stomach with all your favorite holiday foods, the carbs you’ve eaten give the amino acids and proteins in your body something to do. It takes a lot of energy to digest all that food, and break down all the sugars in the carbs. This allows the L-tryptophan to produce serotonin and melatonin, making you feel sleepy. Thanksgiving isn’t about the turkey after all, but about the carbs. It’s not just the carbs fault either, and it could really be a simple case of overindulging. After all, Thanksgiving comes just once a year! All the food in your stomach, whether that included turkey or not, needs to be digested, and costs your body a lot of energy. While your body works hard to digest your food, resting is the best way for your body to conserve energy, and devote more energy to processing all that food while you’re resting on the couch. If you’ve been tasked with washing dishes after dinner, and you’re feeling too exhausted to load the dishwasher or scrub the pots, there’s really no way to combat the after-dinner fatigue. The best thing you can do it try to regulate how much you eat during dinner, and try not to overeat. Your other option is to realize that you’ll be drowsy after dinner, so give yourself time to enjoy the day and eat a wonderful dinner, then give yourself time for a nap before cleaning up. Have you been struggling to fall asleep at night? Do you feel drowsy after Thanksgiving dinner, or do you feel tired all the time? We want you have a great night’s sleep every night, and wake up refreshed every morning, whether or not you had a Thanksgiving Day nap. If you’ve noticed any problems with your sleep cycle, reduced alertness during the day, and a drop in your ability to concentrate and get tasks done, visit us at Sound Sleep Medical to discuss your sleep habits and health.